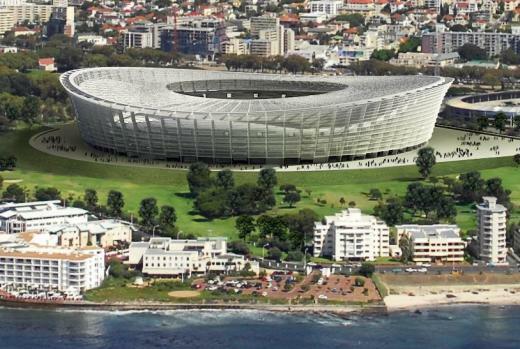 One of the stadium that will be used in the 2010 World Cup is the Green Point Stadium. This stadium is located in the city of Cape Town is bordered by the Atlantic ocean. Cape Town itself is a very beautiful city. The town is located between the Atlantic ocean and Table Mountain. At first this stadium has a capacity of about 18,000 people. However, in order to establish a 2010 World Cup performances, the government rebuilt and raise stadium capacity to 70,000 people this. South Africa as World Cup host country must have an international stadium. These stages will be used in implementing the World Cup. One of them is the Soccer City Stadium. This stadium is a stadium that stood in the city of Johannesburg and was built in 1987. This stadium formerly known as the FNB stadium with a capacity of about 80 thousand spectators. 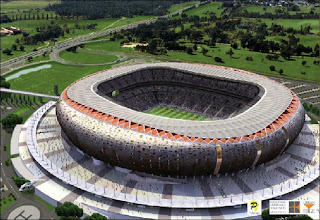 However, the current stadium capacity is increased to 94.700 and a stadium with the largest capacity in southern Africa. The stands in Soccer City are articulated by ten black vertical lines; nine are aligned geographically with the nine other stadia involved in the 2010 World Cup, and a tenth line is aimed at Berlin's Olympic Stadium, which hosted the previous World Cup final in 2006. This represents the road to the final and it is hoped that after the World Cup, each goal scored at the stadium will be placed in pre-cast concrete panels on a podium so that the full history of the tournament’s scores can be seen for years to come.